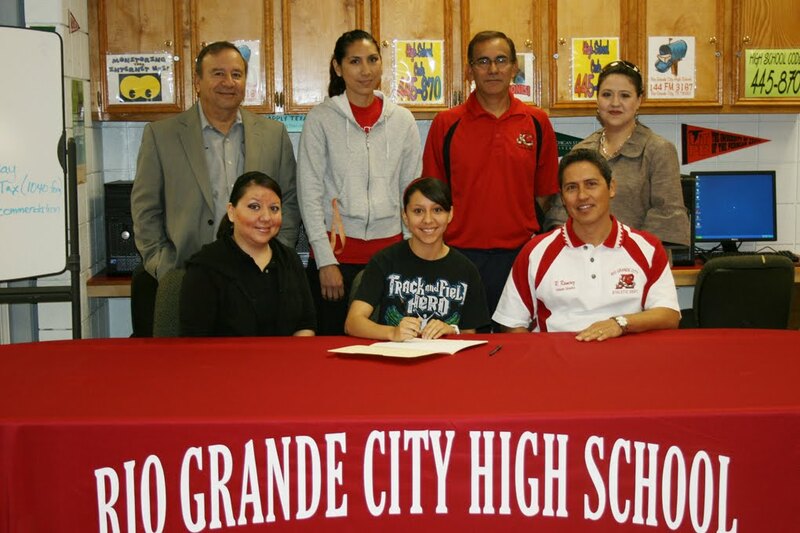 Rio Grande City High School runner, Beatrice Garza, signs for a full ride at University of Texas Pan American. Her scholarship will cover all tuition and housing for four years. Garza's high school accomplishments began her freshman year when she became a Regional Qualifier and made the All District First Team in Cross Country. In Track and Field she also was a Regional Qualifier in the 800 meters, 1600 meters and on the All District Team. Her Sophomore year, Garza, came in 2nd at the Cross Country District Meet, a Regional Qualifier, a State Qualifier and on the All Valley First Team. She also led the Lady Rattlers to qualify for Regionals for the first time in Rio Grande City High School history. She personally came in 9th at that meet. In Track and Field Garza was a Regional Qualifier in the 800 meters, 1600 meters and made the All District Team. Garza's junior year she became a Regional Qualifier and led the team to qualify for the Regional Meet. She was selected for All District First Team and All Valley First Team in Cross Country. Her Track and Field career continued strong and continued to be a Regional Qualifier in the 800 meters, 1600 meters, she qualified for Finals in the 800 meters, and made the All District Team. Her senior year in Cross Country she became a Regional Qualifier, All District First Team and All Valley First Team. 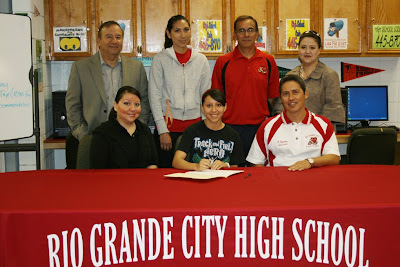 Pictured left to right are; Sitting- Mrs. Garza (Garza's mother), Beatrice Garza, and Rey Ramirez (Athletic Director). Standing- Jorge Recio (Rio Grande City High School Principal), Ana Cortinas (Coach), Ricardo Altahif (Coach) and Roxanne Garza (College and Career AdvAdviserRGCCISD photo.